The three elements of a perfect meal (for me) include cheese, carbs, and a little heat. I need such a meal on a weekly basis. Sometimes more than once a week. This twist on classic penne arrabbiata is a regular in our home. It’s spicier than most, slightly tangy, and so comforting. I use chickpea pasta to boost the health factor, and always pair it with a big salad. But sometimes you want regular penne, no greens, and extra cheese. And that’s okay too. Add tomatoes and chili flakes and bring to a simmer. Add goat cheese and stir until melted. Add salt and pepper, to taste. Add pasta to sauce and toss until the pasta is well-coated. Top with fresh basil and serve! 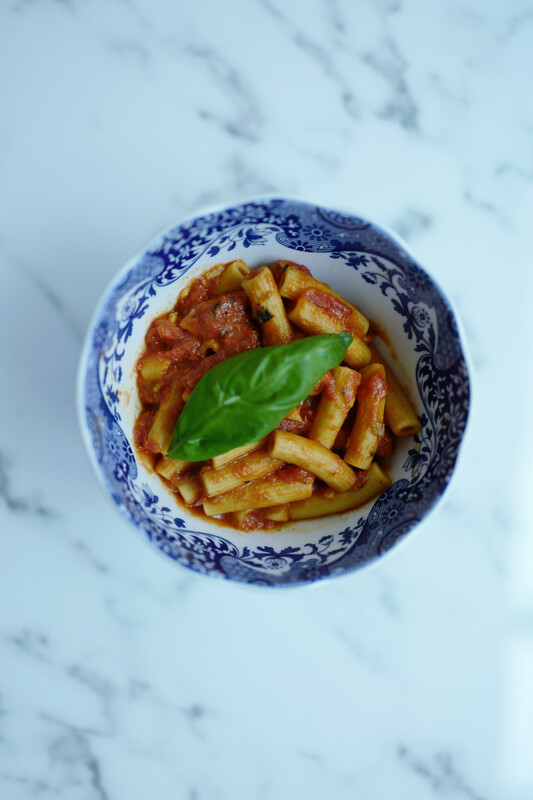 P.S – my other favorite pasta, and another easy weeknight dinner.